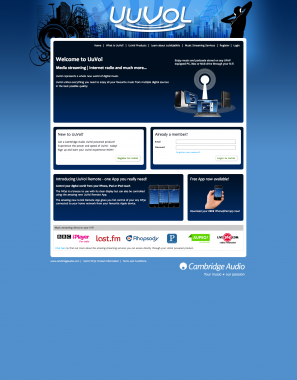 To create a user portal for the UuVol digital network music service. 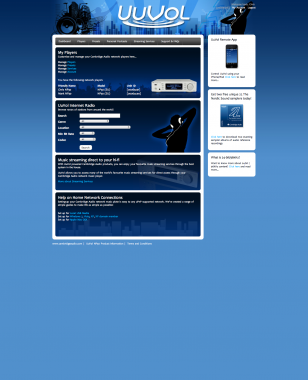 Allowing content delivery and remote hardware management directly from within this user portal. To serve as a content delivery and hardware management hub for UuVol branded digital music hi-fi equipment. Mizu's broad internet media management and delivery experience made us the perfect choice to be selected to create the UuVol portal. Working closely with both the client’s in-house creative team to ensure brand consistency from a creative standpoint and also engaging in a very close relationship with both the hardware developers and the chip developers takes a very special kind of development team. One skilled at communicating and bringing together all of the diverse elements which go to make up a complete internet music portal which directly integrates with digital streaming audio Hi-Fi equipment. The solution needed to be clear, user-friendly and quick to ensure equipment purchasers could access content and configure their streaming services with the minimum of effort. From the initial planning stages, which involved gathering input from all the teams and distilling that information into a clear and workable plan to progress the project, right through the build and integration phase we ensure effective communication guides the project's path at all times. A multi-stage approach to delivery helped the team to provide test versions of the system from very early on in the project's development. This ensures core functionality is honed at the earliest point, providing a more rapid turnaround of feedback and ultimately a more rapid turnaround of the project itself. Our technical team did a fantastic job of delivering exactly what the client required. We worked closely with the user testing teams to ensure first class quality in terms of usability and integration. We also took care of all the installation issues by helping the client to set up the service on their own dedicated hardware platforms and we continue to provide support and maintenance services thereby assuring the client that we are with them for the long haul. Relationships are important to us. We care about what we deliver and it matters to us that the client is proud of the end product.